One dream as if behind a veil, very pleasant: a woman I didn’t know and I decided to find a place and a way to kiss. I had to stand on something like a stool to reach her. We succeeded, it was grand, I was happy. Who was she? 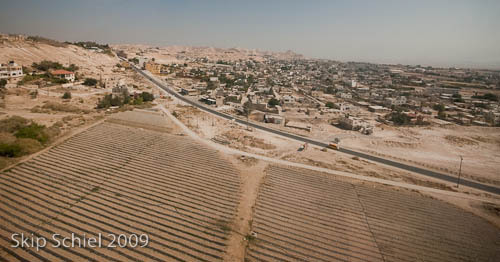 From Jericho to Jerusalem, a short distance geographically, an immense distance socially and culturally, also climatically and politically. 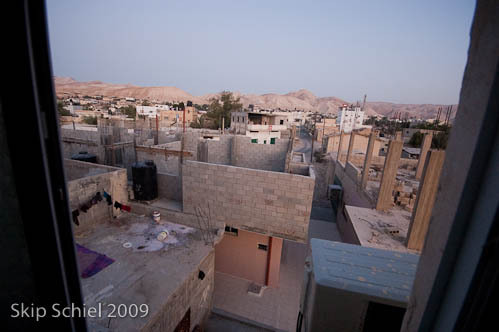 I’m sure I was the only one in the Jericho hostel so it was as if I had nearly an entire house to myself. The manager slept in a small room off the main room on the ground floor. He awoke when I left. He did not look happy, I never saw him smile (I learned the day before that he lost his thumb while butchering.). It was about 9 AM, Palestine time, 10 AM Israeli time—the difference because each entity chooses a different date on which to begin wintertime. 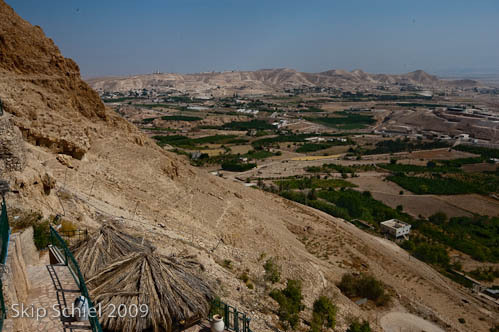 Time to explore the city by car and head for Tel Al Sultan, the oldest part of Jericho, ride the cable car, maybe eat that grand feast of a buffet promised by the owner of the tourist center next to the Tel. Not sure where I was when driving thru Jericho, a common condition, I saw a group of Japanese tourists (they use umbrellas for the sun so they’re either Japanese, Chinese or Korean) emerging from a building, thought, this must be something worth seeing, stopped, parked, inquired when I saw gushing water in pools, is this Elijah’s Spring? It is. Want to see the spring? the attendant asked. How much? 20 shekels ($5). No thanks. And I settled for an outdoor exploration of the springs and pools—the main spring must have been inside the building. But what is a spring to photograph? Not usually of much note. 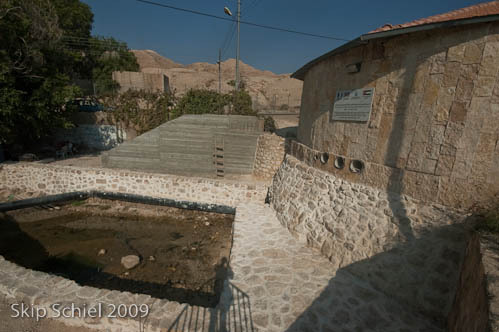 The water had been channeled into 1/2 m wide streams, winding around, with some pools, not nearly as elegant as the Banias springs compound. This was interlaced with pipes and valves and construction materials and debris, not a pretty site, but important. 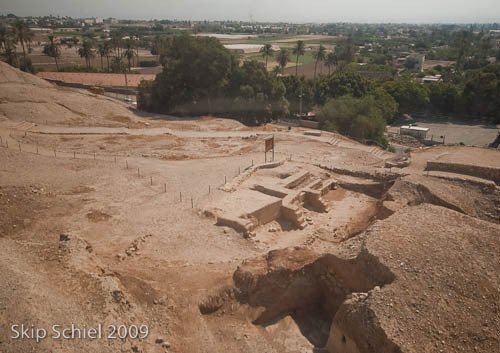 This is the reason the city founders chose this location: in the midst of what seems nearly a desert, less than 2 km from the Dead Sea, one of the lowest points on earth (260 meters below sea level I believe), this became a city. A city? How large? Not sure. Not a city in the contemporary sense, but a stable habitation site. Water set the stage. And now I repeated a discovery that someone had made more than 10,000 yrs ago. Another lucky find (after I’d gone inside another building to photograph a maze of pipes, valves and husky sounding pumps, governing the water supply of this entire region, including the multifaceted agriculture which thrives here) was the technician measuring chlorine content of the processed spring water. I conclude that altho we call this spring water it is not pure in its original state, it needs disinfection. 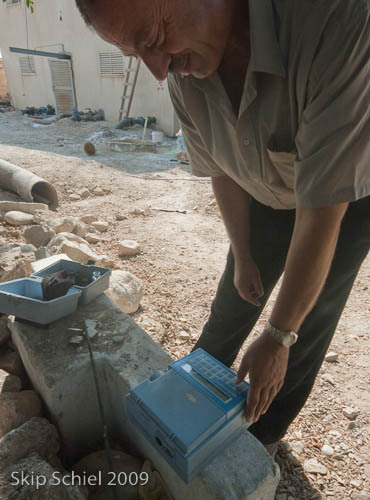 As the technician (in training in Ramallah, he was proud to point out) explained, too much chlorine can also be harmful. After all, it is a poison. Then the cable car, something I’ve longed to try ever since knowing about it when here with the delegation in 2003. 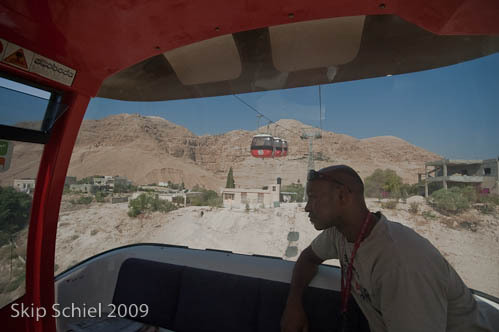 55 shekels wait about 15 minutes at the base for the damned thing to move—not many riders today, Ramadan, as someone explained—and up up up, offering terrific views of the area. But thru distorting plastic so I’m not sure how good these photos will look. 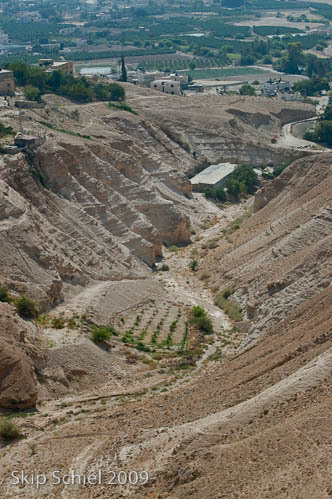 Not exactly the top of the Mt of Temptation (another earth feature for the story of Jesus: 40 days somewhere near here, reportedly, resisting the advances of the evil one. Was Jesus on top of a mountain, down a slope, did he fast from water and food, how were the nights, what season was this, cold, hot, rainy? More questions that the bible is not helpful for. ), but near enough, maybe 2/3 the way, the Greek Orthodox monastery nearby, another steep walk, but not for me. Hot up here and a piercing unrelenting sun. 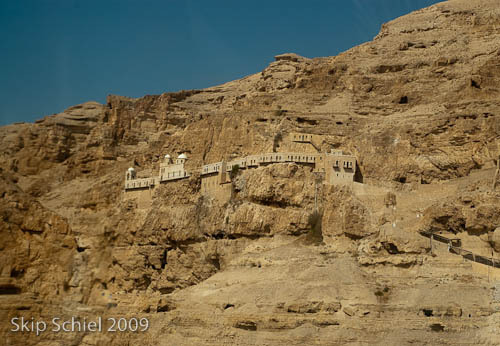 I’ll show the monastery thru my heavy telephoto lens—let my lens do the walking. The attendant at this terminus was elderly, alone, and welcomed me with some questions in faulty English, and then he offered me a small plastic container of cold water and later a single date. He confirmed that crowds flock here during much of the year, but not during Ramadan. I feel for him, just sitting all day alone, not much to do, watching people, if there are people. Maybe thinking about the region’s history, his small role in it. 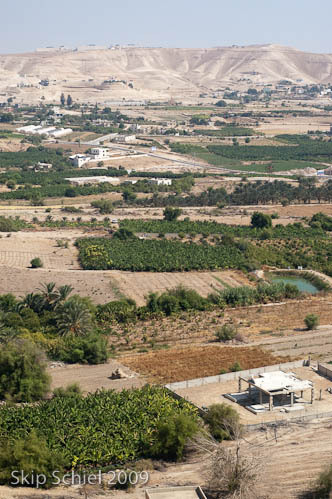 Enough here, ride down, more photos showing the Tel, the hills, fields, houses, and way off in the hazy distance, the Jordan River and valley, barely discernable. The way out from the lower cable car station requires transit thru a mélange of gift shops. Tricky and unfair. I’m not happy with this routing. A few idle bored shopkeepers—gatekeepers—implored me to buy their glass, their olive wood, their this and their that. But I persisted, bulling my way thru the stacks and shelves and piles, to me what is mostly junk, yet to some others, treasures, and to these mostly men their livelihood. How can I be so crass? 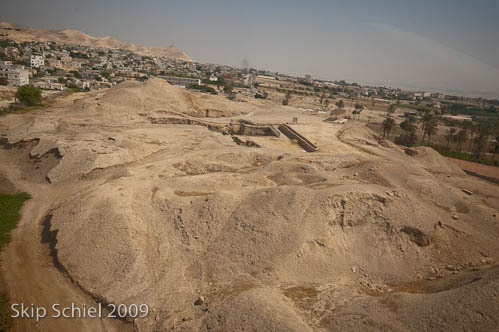 The ancient city is beside the cable car base, relatively small, mostly hills of sand and clay, but buried within and gradually being excavated lies the first continuously inhabited city of the world, 10,000 yrs, Jericho, The City of the Moon. Why this is called Tel Al Sultan escapes me. I love sites like these: the remains of people, loves suffered, lives lost, battles fought, children raised, ceremonies enacted, myths constructed and denied, stories lived and then forgotten, buried in the blowing sands, stones, hunks of clay. Unfortunately, as with Elijah’s Spring, there is not much to see, thus not much to show photographically. I struggled, poised between imagination and reality, the imagined life here, what this was and is and means, and the reality of sand and clay in mounds with occasional dug out sections, and lots of explanatory panels. Even peering at the panels, trying to make sense of the layers of civilization, all colored in for quick visualization, I was lost. 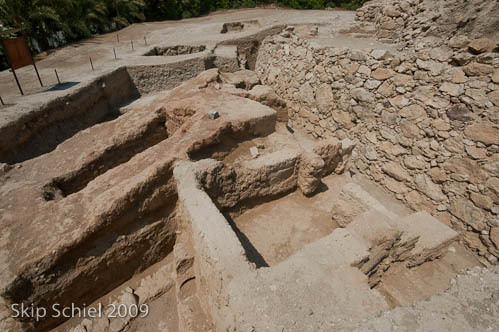 Early Middle Bronze, to Late Middle Bronze, over Iron Age, etc. Didn’t mean much to me without careful study—which in the heat and press of time I was not willing to do. For the photos maybe the light will help, with its dramatic shadows. I look forward to grappling with this problem in postproduction, an inherent weakness of photography: unable to show what once was. Finally the main restaurant and tourist center where I’d been the night before. Too late to hook into their wifi system, I need to return this rented car and drop off my heavy black hard plastic ailing wheeled luggage. But I’ll stop in to refill my water bottle and brush my teeth (the night before I’d left my toiletry bag in the car, too lazy to retrieve it when I realized my loss, and not wishing to plow thru the gobs of children outside in the cool evening of Ramadan). Asking where I might refill with safe drinking water (even tho I’d seen a young man filling his bottle from a fountain in the parking lot, presumably supplying spring water, I’m suspicious of any uncertified water) a man directed me to a small kiosk inside the main center. Greeted by a smiling gent named Elias, he filled my bottle, and asked me the inevitable question, where are you from? Telling him, he then launched into a sad and sweet story of having a sweetheart in New York City who is a lawyer and wishes to marry him if they can find a way for him to leave Jericho. They met here at this emporium. His hopes are vast, his chances of emigration probably minimal. The story remains sad and sweet. He might have noticed how resonant I was with this tale of love. He gave me a free glass of lemonade. 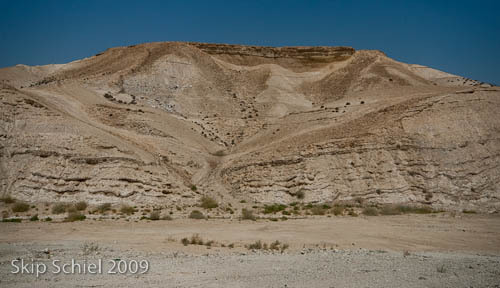 I’m ready to leave Jericho, content with myself for persisting this long on my 2-week journey tracing water. Jericho might make a fitting conclusion to a new show. Altho, to be complete—this might be for my next visit—I should continue the sojourn to the Dead Sea and into the Negev, all the way to Eliat and the Red Sea. What a journey. I wonder if anyone has accomplished this. 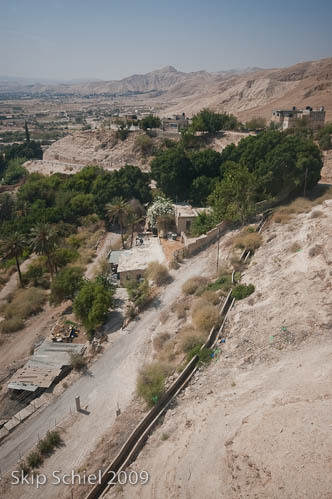 Uphill to Jerusalem. Stopping periodically to photograph the limestone hills and then the cut olive groves. Who did this and why? Settlers, the state, the Palestinians themselves? The long winding road home. What is home? The Palm Hostel? East Jerusalem? Ramallah? Cambridge? Driving thru Jerusalem was a problem. I had to thread my way thru torturous traffic. Jerusalem is easily the most complicated city to drive in I’ve yet experienced. 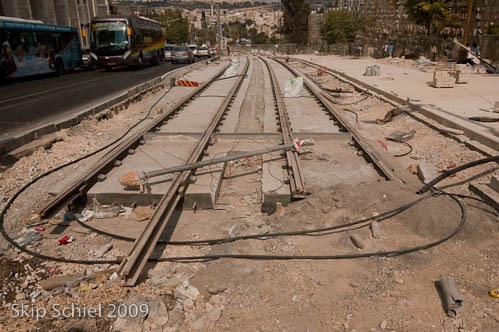 Not established during the automobile craze, or anticipating ever being a large city, and affected deeply by the topography, Jerusalem is not made for autos. Entering was easy enough, well-signed, clear exits, into the central city. And then what? 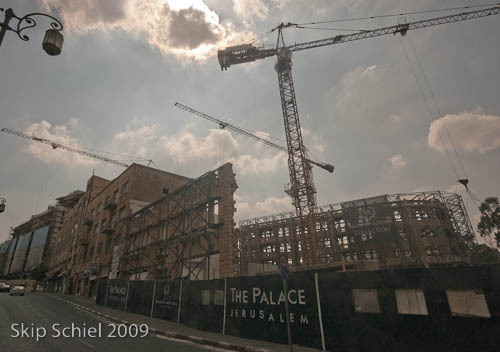 First the Palm in East Jerusalem, just head for Damascus Gate. And surprisingly I found a parking spot outside the hostel so I could unload my luggage for temporary storage. And then…oh my god, oh sweet Jesus, please direct me thru these winding, unmarked, jammed, narrow streets. Back and forth. Trying to pull off the road for a few moments of relaxed map reading, I found myself in a forbidden area—the American Consulate and a staff member warning me away. Then the mis-directions, one man telling me I was almost at King David Street (my target for Avis) but turn right. I did and found myself on Agron Street, not King David. Did I mishear or was he confused? After about 30 minutes of this nerve wrenching, confusing travel I found Avis. They thought I could escape paying my parking ticket (which I seem to have lost anyway). The government will just send a bill to your home address. In the USA? Yes, they said, winking. Which I take to mean, how can they collect? So I’ve enacted a personal sanction on Israel, denying them 100 shekels, which is not theirs rightfully since I am a dumb tourist and didn’t know the rules (explained in Hebrew). Unload my gear and lug it back to the Palm thru the streets of downtown West Jerusalem. Not a bad route because first I passed several huge building projects, several on the remains of old Arab buildings, and then the light rail tracks running right past Jaffa Gate. I hadn’t realized this would be the route, or that I’d be so close (I also photographed driving in, trying to navigate, steer, watch for signs of the railroad, and photograph, all at once—a wonder I didn’t crash.). So all was well, all was well. As I’d prayed it would be. So far. Mitigating my anguish: the cool air. At last, a respite from the heat I’ve been experiencing nearly continuously since entering Gaza more than 6 weeks ago—and before that, when I entered the region nearly 3 months earlier. Cool and breezy, another full moon romantic evening. Wish you were here with me, Y, X, ME, B, KA, M, L1, R, and numerous others, one at a time. At the Palm Hostel I met Hisham, by now an old friend and colleague, looking his usual sickly self. Poor guy, a heart attack apparently when younger, impeding his mobility and language. He’s planning to travel to Ramallah today and I might go with him to ISM. While we chatted my phone rang: a woman who announced herself as the one I’d met in a restaurant in Gaza. At first I thought this was Assa, YB’s friend, but this woman’s English was rougher than Assa’s. And then I realized, W, from Popeye, the strong divorced needy woman, about the only woman I ever saw in the male only Popeye Internet cafe. She’d invited me to visit her in her home in Khan Yunis, I’d been suspicious, checked her out thru Amal, caused a stir in the office when they heard this story not from me, and then, intending to visit her with another of my friends, the battle between Hamas and a rival happened and independent travel became difficult. I should write her all this, and send here a photo as a gift. I feel very bad now that I’d not visited her, or even called her to say goodbye. So how can I make it up to her? When I told her where I was she sounded envious. She is trapped in Gaza, can hardly get to Egypt; Jerusalem would be, at this moment, impossible. Oh, the trauma, the heartbreak, the pain. ME has sent me 3 articles in the past few weeks, most unusual for her, while avoiding writing much about where and how she is. An article in French about a woman giving cameras to women in poverty in the States. A set of photos unrelated to this article with her top choices. And then a few days ago, a report about the physical and psychological effects of meditation. I had the first article translated by an automatic online device and was able to understand most of it. I replied mentioning Shooting Back which is a similar project, both Shooting Back in the States and in Palestine, same name, separate, similar idea. I’d earlier written her about the photos expressing my preferences. And now the meditation article that I forwarded to meditators in my circle like Elaine and Louise. E from Israel has commented several times about my references to my “lady friends.” And wrote yesterday that she and her husband periodically fall in love with others and usually confide this new development to their spouse. Or if they try to keep it secret, the new love feeling is apparent. Ah ha, I replied, maybe had I known this when married or partnered those relationships might have survived. In other words, building in some stretching room. The New Palm. Now I think I realize why they’ve renamed it the New Palm: it has a new hotel adjacent to the old hostel. I will skip over the details of arriving here and the rudeness I’ve encountered, only mention meeting Hisham, and the good Internet access thru wifi they offer. Free, fast, sturdy, reliable. About the first in my last 2 weeks. Last night, once I thought Ramadan eating time had arrived—I usually listen for the muezzin but didn’t hear him last night—I found the streets and Old City thronged with merry makers, lights, food. The nearby restaurant I usually patronize had moved much of its operation outdoors. Chicken and rice with soup, no bread or salad, 30 shekels, compared with 50 at the Jericho tourist center. I ate sitting on a stoop outside, watching people, no room at tables. 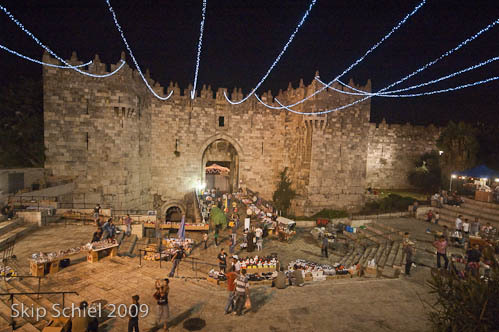 A walk thru the Old City, stopping at the Damascus gate to photograph the lights and crowd, and then asking at the Austrian Hospice where I have a 2 night reservation later in the dorm if I could view the dorm. No, people live there, a lame excuse. But yes, wireless. To bed, to bed, earlier than usual, I was tired last night. Maybe relieved of hidden worries from the car trip. In a stuffy dirty dorm room shared with, it turned out, I didn’t know at first, 2 other men. Slept well enough, and now writing and about to do email and wait for Hisham for our trip to Ramallah.